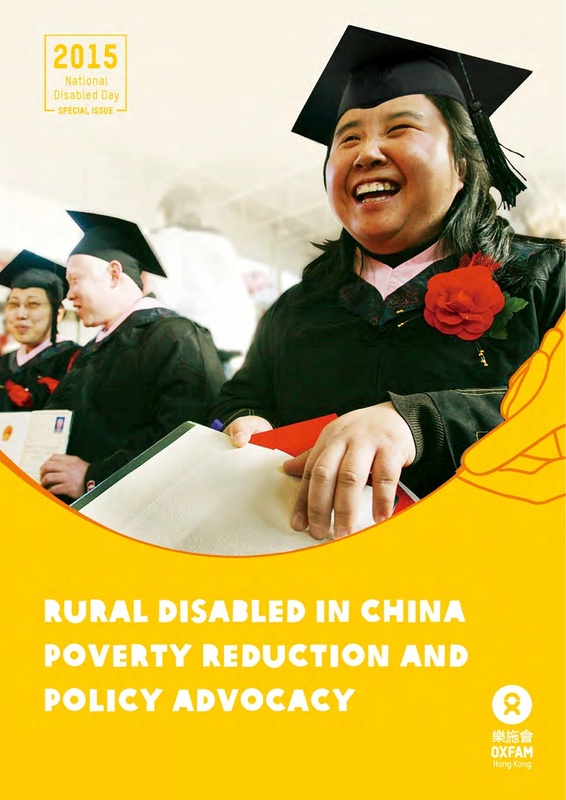 Oxfam Hong Kong recently released "Rural Disabled in China, Poverty Reduction and Policy Advocacy" amid the National Disabled Day in China this year, to present the current living conditions of the disabled people in rural China and encourage more accurate policies and supports for them. Disabled people are often socially excluded because of certain physical or mental defects. They have fewer development opportunities and face more difficult living conditions. Therefore, they should be a focus of social protection policy. Poverty reduction for disabled people is a global issue and constitutes a key challenge in rural China. According to the 2nd National Sample Survey on Disability, the number of disabled people had reached 82.96 million by April 1, 2006, 6.34% of the total population. Among them, based on different levels of disability, 29.62% were severely disabled (grade-1 and grade-2) and 70.38% were moderately disabled categorized as grade-3 and grade-4 disability. According to the statistics compiled by the 6th Nationwide Population Census and the 2nd National Sample Survey on Disability, the total disabled population in China reached 85.02 million by the end of 2010, of which three fourths lived in rural areas. Research on disabled people from the contiguous destitute regions further shows that the biggest challenge for rural disabled people is still survival. Some of them are still living in absolute poverty, with not enough food and proper cloth and no money for medical treatment. More disable people are living in relative poverty, as they and their families’ do not share the same benefits of the social development brought about by the fast-paced development of rural economy and society. Instead, the gap between the disabled people and the non-disabled are growing, which in turn, makes them feel even more impoverished.